You can read our housing and homelessness analysis of the governor's budget here: 2015 Budget 1.0 - Our Analysis. At around 11:30am today, the Washington State House of Representatives released their operating and capital budgets for the 2015-2017 biennium. You can read both budgets in their entirety at this page. While there are some things that can be strengthened, we applaud the House for including new revenue and making significant investments in affordable homes and services that help people meet their basic needs. Check out our bill tracker here for how the House budget compares to the Governor’s budget. The budget emphasizes the Department of Commerce’s role in awarding “loans and grants on a competitive basis to affordable housing projects statewide.” It outlines a minimum number of homes and beds to be created for seniors, families with children, people with disabilities, veterans, homeless youth, and farmworkers. It also provides significant flexibility to fund other low-income housing if the state lacks suitable projects in those categories. This funding would help enable low-income households to make weatherization improvements to save homeowners money and decrease home energy consumption. Money in this category is marked for renovation and upkeep needs (aka “capital needs”) for homes that have received previous HTF funding. These funds would be used to pilot innovative energy-efficient designs for single- and multi-family affordable housing. This small allocation is to help purchase land for affordable housing related to the relocation of low-income households from the Fairchild Air Force Base flight path. While the House largely didn’t bolster safety net programs that have been cut over the past five years, they did a lot to preserve what is currently in place. The House also made investments in new services for homeless families and youth. Unfortunately, they did so in one case by shifting resources from other critical homelessness services instead of increasing the overall investment in homelessness. These services provide a lifeline of support for very low-income single adults with disabilities so they can keep their home and thrive. It appears that funding for HEN may have been preserved at current levels. It is confirmed that funding for ABD and SSI Facilitation Services are fully preserved. This fund provides stable, long-term funding for both on- and off-site supportive services linked to affordable housing for young people and families. While we recommended investing $6 million for the fund, the House ended up matching the Governor’s allocation of $3 million. This program is a critical lifeline for vulnerable families across Washington. We support our partners’ goals of restoring the 15% cut to the TANF cash grant and implementing other improvements to make TANF work better for Washington’s families. The House matched the Governor’s budget in that it neither restored nor significantly cut the TANF grant. We were surprised and disappointed to learn that this received no funding. But, we still have an opportunity to make sure this is included in the final budget. This would allow more chronically homeless people to access housing and services and help individuals with severe and chronic health issues stay off the street and live in a healthy home. Stay tuned, as we’re sure to have more developments next week. More about this benefit at our state advocacy page. While the House proposal doesn’t include the Governor’s proposed carbon tax that dedicated some funding for the Housing Trust Fund, it does raise new revenues from a Capital Gains Tax, closes tax loopholes, and expands the B&O tax to professional services. 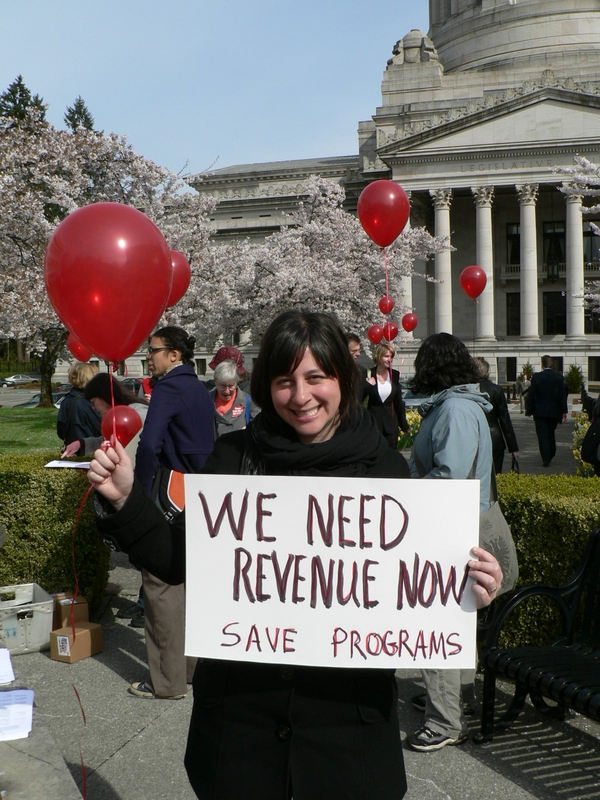 Our friends at the Washington State Budget & Policy Center have more revenue details about the House budget over at their Schmudget blog. The House budget hearings will take on Monday, March 30. The capital budget hearing is at 8:00am and the operating budget hearing is at 1:30pm. If you are interested in testifying at a public hearing, please email Michele Thomas. And stay tuned, as we’ll also have an action alert that will allow you to quickly and easily email your elected official both thanking them and letting them know how they can improve the budget. Last week, Olympia was all about bill hearings and budget rumors. Many of our support issues, such as Extended Foster Care - HB 1735 (Orwall) / SB 5740 (Fain) and the Homeless Student Stability Act - HB1682 (Fey) had hearings, which sets them up to keep moving through the process. You can reference our bill tracker for the current status on all the main bills we are tracking. And check out this great Seattle Times editorial urging lawmakers to fund the Homeless Student Stability Act. Tell Your Legislators to Protect HEN, ABD & SSI Facilitation. Increasing housing costs means increased pressure on everyone, especially our most vulnerable neighbors. Over 195,000 households in our state have extremely low incomes and are paying more than half of their income on housing costs alone. For these families, an illness, an accident, even a simple fender bender can result in a disability that can make it impossible to work. This leaves them extremely vulnerable to losing their housing and falling into homeless. The Housing & Essential Needs program; Aged, Blind & Disabled program; and SSI Facilitation Services are lifelines for very low-income people with disabilities that prevent homelessness. Help us ensure legislators prioritize protecting these important safety net services! Lawmakers with budget-writing roles were busy at work last week, and there was a lot speculation about when the House will release its budgets. But the House hasn’t given a firm date for the release. It could be as early as this week or as late as the first of the next month. As soon as it comes out, Housing Alliance staff will analyze it and will post an update on our blog. We will be looking at the operating budget to make sure that there is funding for a Medicaid Benefit for Permanent Supportive Housing, that HEN/ABD and SSI facilitation services are fully funded, that there is $6 million for the Washington Youth and Families Fund, and that there is funding for other important programs and services. And we will of course be looking at the capital budget with hope of $100 million for affordable housing. Stay tuned for updates! Lawmakers Need to Hear from You! Take this opportunity to educate lawmakers on the importance of fully funding the safety net services provided by HEN and ABD, and SSI facilitation. Need a brief overview of what these programs do? See our factsheet here. While we expect the House budget to follow the Governor’s lead and fully protect these programs, we need to continue to educate all lawmakers about why these programs are so important. They have frequently been targeted for cuts in previous budget fights, but effective and relentless advocacy has protected them. We need to keep the advocacy up. Please take action today! Are you attending the 25th Annual Conference on Ending Homelessness in May? It will have a lot of workshops for advocates this year! This year’s Conference on Ending Homelessness will take place on May 13 and 14 in Tacoma. The program features nearly 50 workshops including numerous opportunities for advocates! You will have the opportunity to dive into current policy issues, deepen your advocacy skills, and meet people from across the state who are also engaged in advocacy to end homelessness. Early bird registration and scholarship applications opened last week and we encourage you take advantage of the lower rates by registering now. It will be another great conference, and we look forward to seeing you there. Why Does Race Matter In Homelessness Advocacy? Does Class Matter In Homeless Advocacy? Politics, Elections & You: How Political Campaigns Work, The Rules & Getting Involved! Early bird registration, scholarship applications, and reduced conference hotel rates are now open! Hotel and conference registration rates will increase in mid-April, so be sure to register early in order to receive the best rates. We hope you are able to join us in Tacoma this May! And in the meantime, don’t forget to take action to tell your lawmakers to protect HEN, ABD and SSI Facilitation Services! Stay tuned for more updates and thanks for taking action. With last week’s first floor cutoff, many bills are now dead for the session. Unfortunately, the Truth in Evictions Reporting Act - SSB 5376 (Habib) didn’t get brought up for a vote on the Senate floor. The bill was ready for a vote. But then a lot of drama over an unrelated bill ended up consuming significant time and energy on the Senate floor. Our bill, which had bipartisan support, was both a casualty and an innocent bystander. Housing Trust Fund Advocacy Begins Now! Now that we are past the halfway point of session, and the budget release is getting closer, you’ll see we’ll be turning more attention to funding our policy issues and on finalizing the budgets. It is time to ramp up our advocacy on budget related issues. This week is a critical juncture to push for $100 million for the Housing Trust Fund. We have a goal of 150 advocates sending emails! Then please share the action page link with at least three other people who'll take action because you asked them: bit.ly/Week9-HTF. Also dead is SHB 2051 (Farrell) which would have provided local jurisdictions the option of allowing up to 90-days notice of significant rent increases. This bill would have also clarified and improved the standing state authority that allows cities the ability to provide relocation assistance for tenants under certain circumstances. The City of Seattle is currently the only city that has provided for these protections, but other cities are considering them as well. As reported last week, most of the Housing Alliance’s support issues are still alive, with the one exception of SSB 5898 (Miloscia). This bill addressed some issues with HMIS (Homeless Management Information System) and hoped to improve data collection. There may be a chance to still address some of the issues by amending part of the bill onto another one that is still alive. Many advocates and legislators can use this strategy at this point in the session. If there is a bill that is still alive that has an appropriate bill title, it is sometimes possible to amend the bill to incorporate some aspects of a dead bill. This is one reason why you may hear people say that no issue is really dead until the gavel signals that session is over. Any bills that don’t make it this year will have the opportunity to be revisited next year. It is frequently assumed that bills will take multiple years to pass, with the first year of a bill being an “education year”. Of course, we prefer good bills to move more quickly through the process. But it is important to know that if a bill doesn’t make it this year, all the education and advocacy will help improve its chances next year. I called into my telephone town hall last week and was really excited to hear my neighbors asking about the Housing Trust Fund, about services for people with mental illness, and about the Fair Tenant Screening Act! I was also pleased to hear that my lawmakers were very well informed on these issues and very supportive. Did you participate in a recent legislative town hall and learn more about where your lawmakers stand on affordable housing and homelessness issues? Please consider emailing us at the Housing Alliance to share what you learned. Click here to email Michele now. And don’t forget to check if there is a town hall coming up. As we shared last week, you can stay informed about town halls and more by signing up for your lawmaker’s newsletter and by checking their homepage at leg.wa.gov. Here are two lists of some upcoming town halls. One is compiled by the Washington United for Fair Revenue Coalition. And this one is from the Washington State Senior Citizens' Lobby. If you don’t see your lawmakers on either of the lists, be sure to double check their homepages to see if one has been scheduled since these lists were last updated. Share the action page link with all of your coworkers: http://bit.ly/Week9-HTF. Share the action page link with at least three other people who may only take action if you ask them to: http://bit.ly/Week9-HTF. Are you a board member? Ask your fellow board members to join you in taking action this week: http://bit.ly/Week9-HTF. Are you a student? Ask your classmates to join you: http://bit.ly/Week9-HTF. Do you attend religious services? Bring this up and suggest that others join you in action: http://bit.ly/Week9-HTF. Post the action page on Facebook. Promote the action page on Twitter. Finally, we have this excellent opportunity for staff and board of Housing Alliance member organizations. Our friends over at the D.C.-based National Housing Conference (NHC) are organizing a two-day gathering in Seattle from April 7-8. Registration rate is $150, but up to 35 Housing Alliance organization members will receive a 20% discount using the code. Register here, and when prompted, use the discount code: WLIHA20. If you’re not sure if your organization is a member, check here. Gaining community acceptance for affordable housing has long been a sticking point in developing successful communities. National and local polling data often show support for solutions to homelessness and housing affordability challenges, but when it comes to siting, neighbors often balk at the prospect of affordable housing being built nearby. Community opposition can create delays that put developments in jeopardy and make it tougher for the next affordable development to succeed. NHC's Solutions for Housing Communications 2015 Convening will connect you with over 200 affordable housing developers, advocates, funders, and government officials for panels, workshops, and round-table discussions on challenges and opportunities in community acceptance. We'll learn together, discovering best practices for countering community opposition and exploring creative new approaches to meeting this perennial challenge. March 11, 2015 was an important cutoff date for the Washington State Legislature. Most bills needed to be voted off of the floor of their chamber of origin in order to advance toward the eventual goal of becoming a law. Three bills that died would have helped protect vulnerable renters. The Truth in Evictions Reporting Act or SSB 5376 would have fixed a flaw in the way evictions are currently reported. Tenant screening companies report all eviction lawsuits as equal, even lawsuits that have been settled to the landlord’s satisfaction or when the tenant has won in court. However, eviction court has many different outcomes: the tenant could have been wrongfully named, the tenant could have been a victim of their landlord’s foreclosure, or the tenant could have won. But, none of this matters as tenant screening reports list all eviction lawsuits as equal. The misleading and inaccurate tenant screening reports make accessing a rental home much more difficult in the future. SSB 5376 would have ensured that tenant screening reports are fair and accurate and don’t report all eviction records as equal. Another tenant protection bill that did not make the cutoff was SHB 2051 or the 90-day Notice/Relocation Assistance and Rent Increase Bill. This bill would have given cities the ability to ensure tenants have reasonable notice of at least 90 days for large rent increases. HB 1565 and SB 5378 creating statewide protections from source of income discrimination were other opportunities lost this session. These bills would have made it illegal for a landlord to deny housing solely because the household is relying on assistance to pay a portion of their rent. As more and more families in Washington struggle to pay rent, our state needs to ensure that vulnerable households have housing opportunities. SHB 1257 will make the tenant screening process more practical and economically efficient for both tenants and landlords. In a housing search, tenants will be able to buy just one tenant screening report that they can provide to all prospective landlords requesting the data. The Housing Alliance also supports funding the Housing Trust Fund at $100 million. The vast majority of state investments in affordable homes assist people who are extremely low-income and are otherwise unable to afford a home. Housing and homelessness advocates across the state will be watching the budget process closely to ensure legislators robustly fund this effective budget tool for shrinking the affordable housing gap. Last week was eventful again for affordable housing and homelessness issues, with many important bills being voted out of their chamber of origin. As we mentioned in last week’s email, Wednesday, March 11 is the last day bills can be voted off the floor. (All bills directly related to the budget are exempt from this cutoff.) The next step for bills that make it past Wednesday’s cutoff is the policy committee in the opposite house. We are very happy to share that the following bills had already cleared this hurdle as of Friday, March 6. A huge thank you to everyone who took action last week and sent messages to their legislators asking them to support HB 1257 the Fair Tenant Screening Act. The bill was voted out of the House with 51 yeas and 47 nays. This is a very important milestone, and it means we are that much closer to passing this bill into law and ensuring that people have an option other than to be charged over and over again for duplicate tenant screening reports. It's very important that we say thank you to the legislators who voted in favor of the bill and remind the others about why the legislation is necessary. We make it easy for you to send your "thank you" or "please reconsider" emails to your representatives. This top priority bill was voted out of the House on Thursday after an eventful floor debate. You can watch the floor action here. Representative Brady Walkinshaw (43rd LD-Seattle) is the prime sponsor and has been a skillful and fierce leader: Brady.Walkinshaw@leg.wa.gov. Representative Laurie Jinkins (27th LD-Tacoma) is the chair of the Judiciary Committee and a cosponsor of the bill. She has done a lot of behind-the-scenes work to move this bill and did a fantastic job opposing a slew of bad floor amendments: Laurie.Jinkins@leg.wa.gov. 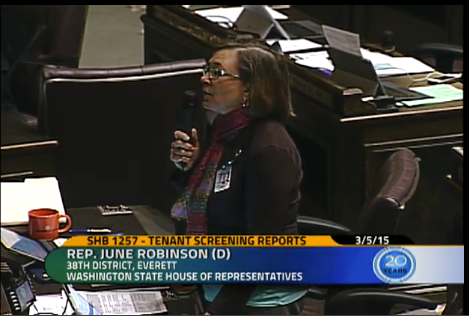 Representative June Robinson (38th LD-Everett) has been a long time supporter of this issue. She is a housing leader and was the prime sponsor on last year’s bill. Her floor speech was a perfect summary of the reason this bill is so important, and we greatly appreciate that she shared the story of a Housing Alliance leader and Emerging Advocate graduate Thomas Green: June.Robinson@leg.wa.gov. Representative Steve Kirby (29th LD-Tacoma) impressed many during the committee hearing back in February with his strong words that expressed the same frustration that we feel about the endless roadblocks thrown out to prevent this problem from being solved. He shared that frustration again on the floor. He was speaking for so many of us who have been working long and hard: Steve.Kirby@leg.wa.gov. Representative Linda Kochmar (30th LD-Federal Way) was the lone and brave vote from the Republican caucus. We know it can be hard to be the standalone if your caucus has made the decision to act in unison, (as it appears that they did on this bill). She deserves your thank you for voting her conscience and for standing up for what is right: Linda.Kochmar@leg.wa.gov. Also known as “the King County Stadium Bonds Bill”, SHB 1223 passed the House late Thursday night with bipartisan support. In 2011, the State Legislature authorized King County to use a portion of lodging tax revenues to develop affordable homes for working families, but these funds are not available until 2021. Simple clarification language for the existing legislation would help non-profits and housing authorities build these homes much sooner. Thanks are due to Representative Larry Springer (45th LD-Kirkland) for his great leadership: Larry.Springer@leg.wa.gov. The Senate companion SSB 5208, was still in Senate Rules Committee as of Friday evening. The Homeless Youth Act passed the House earlier this week with significant bipartisan support. The act will also establish the Office of Homeless Youth Programs to coordinate funding, policy, and practice efforts related to homeless youth and young adults and to make recommendations to the Governor. In addition, the act will create a Homeless Youth Advisory Council to serve as a liaison between service providers and state government. Representative Ruth Kagi (32nd LD-Seattle) deserves thanks for her leadership: Ruth.Kagi@leg.wa.gov and Representative Maureen Walsh (16th LD-Walla Walla) also deserves thanks for effectively securing significant bipartisan support: Maureen.Walsh@leg.wa.gov. The Senate version 2SSB 5404 is on the Senate floor, but not voted on as of Friday evening. The Homeless Student Stability Act was pulled to the floor and voted off the House floor on Friday! This act will provide schools with much-needed support to identify and serve homeless students. In its current form, HB 1682 would provide funding to OSPI to help support schools in identifying and coordinating services on behalf of students experiencing homelessness. The bill would also provide support for school housing partnerships. In the current version of the bill, the amount for HSSA will be determined by the budget. Special thanks are due to prime sponsor Representative Jake Fey (27th LD-Tacoma): Jake.Fey@leg.wa.gov. Extended Foster Care passed the House Thursday. Passing this legislation will provide youth with a documented medical condition the opportunity to remain in the foster care system until the age of 21 in order to achieve a high school diploma/GED, pursue their post-secondary education, or pursue programs that break down barriers to employment. Thanks are due to the prime sponsor Representative Tina Orwall (33rd LD-Des Moines): Tina.Orwall@leg.wa.gov. The Senate version SSB 5740 was pulled out of the Senate Rules Committee on Friday. The HMIS bill was pulled from Senate Rules to the Floor on Friday evening. This positions it for a vote before Wednesday’s cutoff. Changes to Washington's current HMIS informed consent privacy statute (RCW 43.185C.180) from "opt in" to "opt out" could help improve statewide compliance and strengthen privacy protections, especially for survivors of domestic violence. This is the bill that will allow TANF (Temporary Assistance for Needy Families) recipients to complete two years of education while receiving TANF instead of just one. The bill passed on Thursday with very significant bipartisan support and Rep. Maureen Walsh is (once again) deserving of thanks for her great leadership: Maureen.Walsh@leg.wa.gov. After March 11, committees will resume a regular meeting schedule, and attention will start turning to the upcoming budget release. This year, the House will be the first go public with their budget proposals, with March 23 being the approximate date of release. In the meantime, policy bills that make it past the March 11 cutoff will need to be scheduled for a hearing in the opposite chamber. The committee chair gets to choose which bills they want to give a hearing to. If they want to stop a bill from progressing, they simply refuse to hear it by the next deadline on April 1 (seriously). Last week’s progress is thanks to your extraordinary response to the call to action. Thank you for contacting your legislator and for pushing your networks to join you. It worked, and we will likely need you to do the same thing again in the coming weeks. Stay tuned for more updates and opportunities to weigh in. In the meantime, are you signed up to receive your lawmaker’s newsletter? Most lawmakers send out email newsletters, and we encourage you sign up for them. They frequently contain important information that is hard to otherwise find, like notices of upcoming town halls back in their home districts. Town hall meetings with your lawmaker are a great way to emphasize that affordable housing and homelessness issues should be a top priority. And a lot of lawmakers are planning town halls over the next couple of weeks. You can sign up for the newsletters by visiting your lawmaker’s homepage. House Democrats have the option to sign up for their newsletter in the bar on the right of the page, House and Senate Republicans at the top of each page, and Senate Democrats at the bottom of each page. Check out your lawmakers’ pages today to see if there is a town hall coming up soon. Below are a few town halls that we know of. You can see another list of town halls here. This week marks the halfway point of the legislative session, which is scheduled to end on April 26. Last Friday was the second “cutoff” of the session. All bills with a fiscal impact had to clear a fiscal committee in order to proceed. Bills that are considered “necessary to implement the budget” are not subject to these cutoffs. But many policy bills with fiscal impacts are subject to cutoffs, including most of the bills on the Housing Alliance’s support agenda. The next cutoff is Wednesday, March 11. All bills have to be voted off the floor and moved to the other chamber by that date. The next week and a half will include a lot of floor action, so stay tuned for developments as bills move forward. 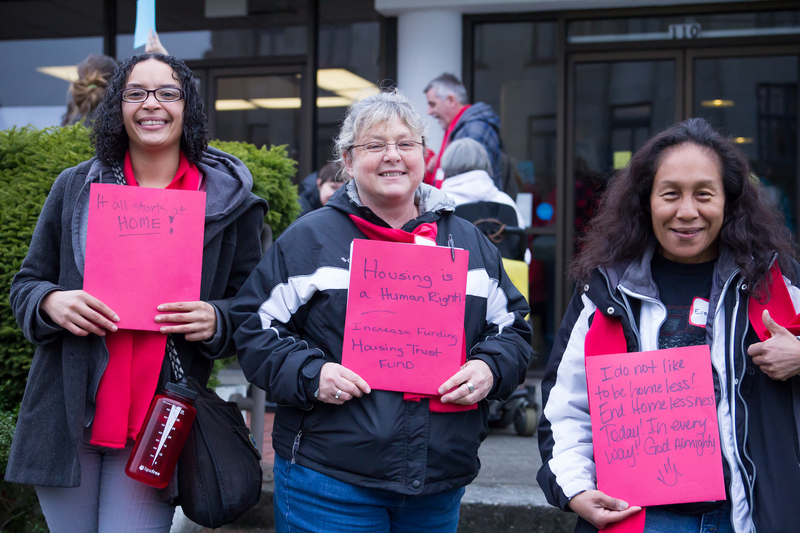 Tell lawmakers to pass crucial legislation to protect tenants before the March 11 cutoff! All bills, including the ones below, have to be voted off the floor and moved to the other chamber by Wednesday, March 11 or they're dead. The next week and half will include a lot of floor action, which is why we need you to click here to tell your elected official that you support bills eliminating barriers to housing. Make tenant screening reports fair and affordable. Pass the Fair Tenant Screening Act (HB 1257)! Ensure innocent tenants won't unfairly have evictions on their record. Pass the Truth in Evictions Reporting Act (SB 5376)! Give cities the ability to make sure tenants have reasonable notice for large rent increases. Pass the 90 day notice Bill (HB 2051)! We are now reaching the point of the session where budget writing will start to take center stage. We’ve heard the House will release their budgets around Friday, March 20. 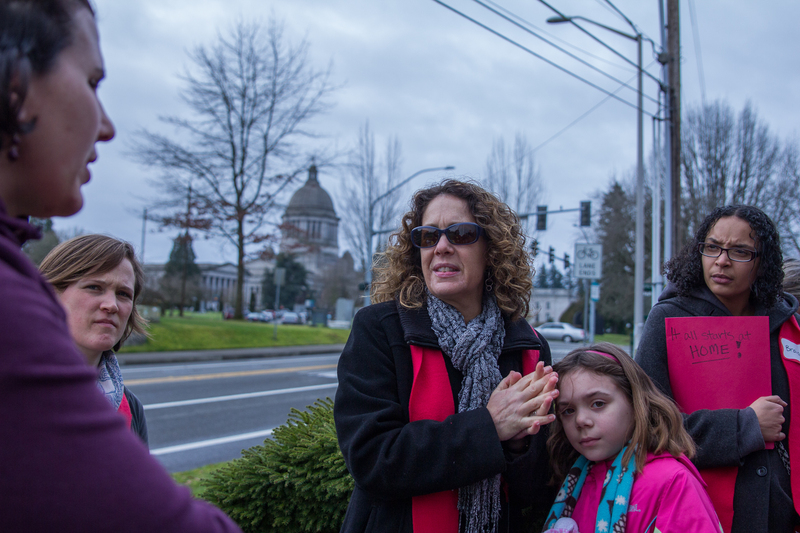 We hope to see a capital budget investment of $100 million in the Housing Trust Fund and operating budget investments in key priorities like the Permanent Supportive Housing Medicaid Benefit and the Washington Youth and Families Fund. We also hope to see the Carbon Polluters Tax - SHB 1314 (Fitzgibbon) move forward, because it is good public policy and because it creates a permanent funding stream for the Housing Trust Fund. Continue to stay tuned to these weekly emails, Housing Alliance action alerts, and social media for updates. Also refer to our bill tracker to see where key priorities are at in the process. Thank you to everyone who took action last week. 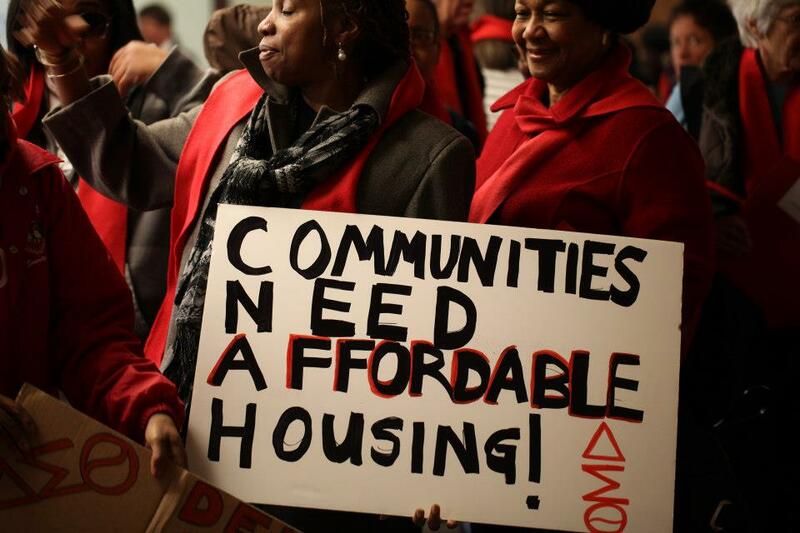 Earlier in the week, many of you called to urge your lawmakers to invest $100 million in the Housing Trust Fund. And then a whole lot of you responded to last Thursday’s urgent request to help get the Homeless Student Stability Act - SHB 1682 (Fey) and Extended Foster Care - SHB 1735 (Orwall) past the Friday cutoff. We are very happy to share that both bills made it through and are now in the Senate Rules Committee with all of our other support agenda bills! ...That's Why We Need You to Keep It Up! We need to keep the pressure up to make sure affordable housing and homeless priorities make it past the finish line. The Truth in Evictions Reporting Act - SSB 5376 (Habib), the Fair Tenant Screening Act - SHB 1257 (Walkinshaw), and the Relocation Assistance and Rent Increase Bill - SHB 2051 (Farrell) all need a push. Last Thursday was the annual Landlord Lobby Day, and we know that they exaggerated the impact and spread some misinformation about the bills. We need your help to correct the record and to urge your lawmakers to vote yes! Please click here to take action today, and urge everyone in your network to join you by sharing the action page link (http://bit.ly/Week7-Action) on Facebook! Thank you for all you do to help move affordable housing and homelessness priorities forward. Your involvement is key, so please keep it up! Last week was extraordinarily active for affordable housing and homelessness advocates. 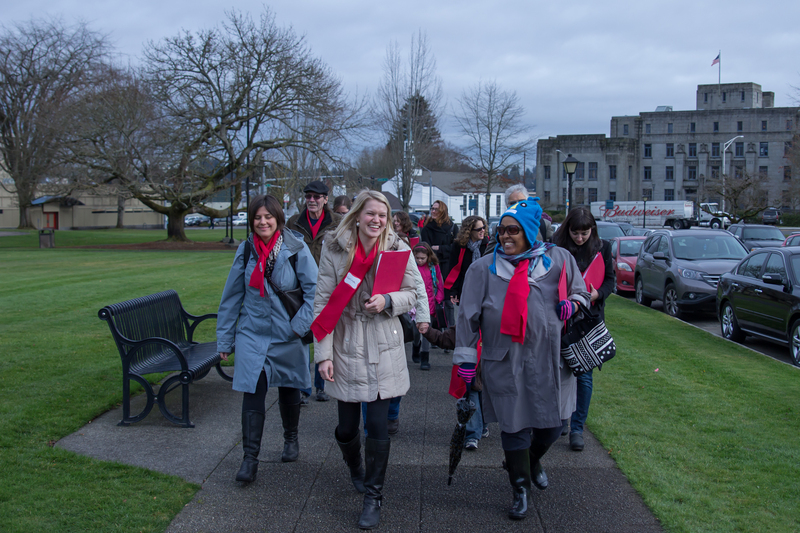 Our annual Housing and Homelessness Advocacy Day was by far the highlight of the week with over 650 advocates in Olympia last Tuesday. The energy throughout the day was electric, with determined and enthusiastic advocates all over the capitol campus carrying important messages to their lawmakers. The day started off with special guests state Senate Democratic leader Sen. Sharon Nelson (34th LD-Maury Island) and Geoff Baker a board member of Yakima Valley based Generating Hope/Noah's Ark. Both challenged advocates to stay active beyond Advocacy Day throughout the rest of the session. Susan Russell, a graduate of the Housing Alliance’s Emerging Advocates Program and recent Real Change Vendor of the Year, delivered a riveting and grounding call to action that kept everyone motivated throughout the long and action-packed day. Susan Russell pictured below (center) with Director of Development Kate McMullen (left) and Homelessness Policy and Advocacy Specialist Kate Baber (right). 1) Call your lawmaker to remind them about the messages they heard from Advocacy Day constituents to invest $100 million in affordable housing! Encourage your colleagues, fellow board members, friends, and family to also make the call! Thank you to everyone who came to Olympia so early in the morning to educate your lawmakers on the important issues we are all working on. Legislators felt your significant impact! Please share your thoughts about your experience. Everyone who registered will be getting an email with a link to a survey so that we can get your feedback. And don’t forget to share your favorite photos from the day with us! We saw a lot of advocates taking selfies and pictures with lawmakers. Please share with us on Facebook. A huge event like Advocacy Day can’t happen without the amazing crew of volunteers who helped plan and execute the day. Thank you to all the Legislative District Leads and folks who came in the wee hours of Tuesday morning to set-up and help with registration. Thanks to those who helped cleanup, run a workshop, and passed out lunches. Also specific thanks to volunteer photographer Lindsay Brandon and to Firesteel and Seattle University Project on Family Homelessness for the social media support and the on-site and off-site photo booths. And an extra special thanks to Alouise Urness, Honah Thompson, and the entire Housing Alliance team for the love and hard work that turned Advocacy Day 2015 into a day to be remembered! We are entering the 7th week of the 15-week session, and you still have a lot of opportunities to weigh in and make a difference. The Housing Alliance is challenging all advocates to commit to contacting your lawmakers at least once each week, until the session is over. Senator Nelson echoed this challenge in her Advocacy Day morning remarks and encouraged folks to continue to weigh in. She confirmed that it is nearly impossible to advocate to your elected official too often, and lawmakers need to hear from you consistently! This week, we are encouraging everyone to call the state’s toll-free legislative hotline to ask your lawmakers to invest $100 million in affordable housing. If last week you were in Olympia or if you called or emailed your lawmaker, personalize the below message as a follow-up for this week. Call your lawmaker to remind them about the messages they heard from constituents at Advocacy Day to invest $100 million in affordable housing! Last week marked the first cutoff of the session. All bills had to be voted out of their policy committee by last Friday in order to continue in the process. Unfortunately, one of the Housing Alliance’s top priorities did not make it out of their committees of origin: legislation outlawing housing discrimination based on participation in a government assistance program, HB 1565/Ormsby and SB 5378/Kohl-Welles. That means that the issue is effectively "dead" for the session. But we will be able to start over next year. The bills are companion bills and would have made it illegal for a landlord to refuse to rent to someone solely because of their participation in a government assistance program to help pay their rent (like Section 8 or a state-funded voucher program). This is a very important issue, and you can bet we will be back on it next year. Thanks to those of you who testified, made calls, met with your lawmakers, and sent letters. You have educated lawmakers and reinforced the importance of the issue for our champions, which will help a lot when we pick this back up next year. Special thanks to testifiers Tamara Gray, Dana Dildine, Kristina Sawycky, Brenda Anibarro, Jim Adrian, Kurt Wiest, Chris Lowell, Jonathan Grant, and Eric Dunn. Thanks are also due to the prime sponsors Senator Jeanne Kohl-Welles (36th LD-Seattle) and Representative Timm Ormsby (3rd LD-Spokane) and also to Representative Jesse Young (26th LD-Gig Harbor). The good news is that all of our other priority and support issues are still moving! Please go to our bill tracker to quickly see which lead and support bills are still alive. The next cutoff is just one week away and all bills with a fiscal impact have to clear their fiscal committee in their house of origin. Bills that don't have a fiscal impact skip those committees and go straight to the Rules Committee. This week will be a rush to get many bills through various fiscal committees. Several of our key support issues need to get through their fiscal committee to order to continue in the process. Stand by for another call to action if any of the issues need extra help to keep moving. Last week was an inspiring reminder of how big, diverse, and strong this movement is. Help us make sure the education and advocacy of Advocacy Day keep going all session long. Pledge to take action each week and mark that by calling your lawmakers today! Thanks much to all of you who have worked so hard to move these important issues. And stay tuned, because there is a lot more work to be done! Communications Specialist Joaquin Uy's selfie (above) with Social Media and Advocacy Workshop attendees. Sen. Sharon Nelson (below) reminding advocates that everyday is an opportunity to talk to your legislators about housing and homelessness issues. 2/23/2015 edit: made corrections to names and updated thanks-yous. The sixth week of the session begins on President’s Day. The next day on Tuesday, hundreds of advocates from across the state will converge on Olympia for Housing and Homelessness Advocacy Day to educate their lawmakers on what they can do this session to help prevent homelessness and ensure more people have the opportunity to live in safe, healthy, and affordable housing. Advocates are coming at the perfect time. Friday the 20th marks the first cutoff of the long session. All bills must be voted out of their policy committee of origin, or they will not be able to continue down the path to becoming law. 1) Thank You, Rep. Walkinshaw! Please click here to send Rep. Brady Walkinshaw (43rd LD-Seattle) a quick note of thanks for his leadership and hard work on the Fair Tenant Screening Act (HB 1257), which passed out of the House Judiciary Committee last Thursday. Click here to email House Judiciary Committee Chair Rep. Laurie Jinkins (27th LD-Tacoma) to ask her to move out of her committee HB 1460 (Habib), the Truth in Evictions Reporting Act, and HB 1565 (Ormsby), outlawing source of income discrimination. Click here to send an email to Human Services, Mental Health & Housing Committee Chair Sen. Steve O’Ban (28th LD-Tacoma) asking him to hold a hearing on the Senate version of the source of income discrimination protection bill - SB 5378 (Kohl-Welles). Let your lawmakers know that creating more opportunities for affordable homes means protecting vulnerable tenants. Take action today by going to this page that will help you quickly and easily send emails to each of your legislators. All of the Housing Alliance key policy bills still need to be moved out of the committee where they started except for the Fair Tenant Screening Act - HB 1257 (Walkinshaw), which was passed out of the House Judiciary Committee last Thursday. This bill will allow tenants to just pay once every 30 days for a tenant screening report when searching for a rental home. Please click here to send Rep. Brady Walkinshaw (43rd LD-Seattle) a quick note of thanks for his leadership and hard work on the bill. Click here to email House Judiciary Committee Chair Rep. Laurie Jinkins (27th LD-Tacoma) to ask her to move out of her committee HB 1460 (Habib), the Truth in Evictions Reporting Act, and HB 1565 (Ormsby), the bill that would outlaw discrimination based on a renter’s participation in a government assistance program to help pay a portion of their rent. Even If You Can’t Make It to the Capitol, You Can Still Help! If you can’t join us for Housing and Homelessness Advocacy Day on Tuesday, you can still make sure lawmakers hear our messages loud and clear. Keep a look out for a message in your inbox, Facebook feed, and Twitter feed for an Advocacy Day action alert. You may not be able to physically be with us in the capitol. But you can still participate. While we’re meeting with legislators face-to-face, you can support us by flooding legislators’ inboxes and voicemails. Stay tuned. Wednesday was the big day last week with the Senate hearing key tenant protection bills. Senator Jeanne Kohl-Welles’ bill SB 5377 gives cities the option to require 90-days notice of a rent increase over 10%. During the Wednesday Financial Institutions & Insurance Committee hearing, many people testified in favor including Seattle City Councilmember Nick Licata and a Seattle tenant who has had over four rent increases in the past five months that more than doubled her rent. The committee also heard the Truth in Eviction Reporting Act SB 5376 on that same day. Although testimony was cut short on the bill, two tenants were able to testify to share their stories of unfair eviction records and the many doors closed to them because of this “scarlet letter.” The committee also heard another bill SB 5259, sponsored by Senator Andy Billig (3rd LD-Spokane). This bill will require landlords to give tenants a voter registration form, which will help ensure that highly mobile households stay registered to vote. If you haven’t yet taken action to ask your lawmakers to support key tenant protections this session, please do so today! Click here to send your lawmakers an email. The House Alliance is challenging you and your fellow advocates to commit to taking action at least one time each week for the rest of the session. Your lawmakers need to repeatedly hear from you. And it is never too much to contact them each week! As long as you are polite and clear, weekly emails and/or calls will ensure that your lawmaker knows that affordable housing and homelessness is a top priority for voters in their district. You have a variety of ways to weigh in this week. This includes attending Advocacy Day this Tuesday and acting on this action alert. And you can help grow our movement by forwarding this blog post to friends, colleagues, and family. Tell them why you care and how easy it is to take action. Encourage them to join you! Thank you for your advocacy so far and stay tuned. We have ten more weeks of the regular session and we all need to stay active and strong in order to ensure affordable housing and homelessness issues keep moving forward. Check out what these two emerging advocates are emerging into. The Housing Alliance is excited to announce two graduates of our Emerging Advocates Program were chosen to participate in The Moth’s storytelling workshops coming up later this month. Congrats to Faye Johnson and Kirk McClain! We know how awesome you are, soon The Moth will too. The Moth is a non-profit organization dedicated to the art and craft of storytelling. The group presents storytelling events across the United States and offers a national public radio show, The Moth Radio Hour. The Moth is partnering with Seattle University’s Project on Family Homelessness to offer two 8-hour workshops on the theme, “Home: Lost and Found” for people with personal stories about homelessness. Participants will learn about storytelling craft and get a chance to refine their own personal stories with storytelling experts. Faye (second from the left) during a 2014 Emerging Advocates Program session. Faye and Kirk went through our 2014 Emerging Advocates Program, where we spent six weeks together building skills and power for people directly experiencing housing instability or homelessness to advocate for positive policy change. When Faye called me up a few days ago to let me know she got into the workshop, I was so excited and grateful to be connected to such amazing leaders who are continually working for positive change in our communities (we could write blog post after blog post about what EAP graduates are up to). Then the next day I got an email from Kirk. He was accepted too. Some of you may know Kirk already or have seen the interview he did with our executive director Rachael Myers at the news site ThinkProgress. Or maybe you read the blog post he wrote, reflecting on his first experience at our Conference on Ending Homelessness last year. If you’re at Housing and Homelessness Advocacy Day next week, tell Faye and Kirk congratulations! They’ll both be there bringing their stories and leadership to meetings with their district’s elected officials advocating for affordable housing policy and ending homelessness. Read more about Check out what these two emerging advocates are emerging into. Last Wednesday was Quite a Day! The big event last week was Wednesday’s House Judiciary Committee, which heard all three of the Housing Alliance’s priority tenant policy bills. Over 20 people showed up in Olympia before 8:00am to testify and to ask lawmakers to support the bills. The hearing started with the Fair Tenant Screening Act, HB 1257. Prime sponsor Representative Brady Walkinshaw (43rd LD-Seattle) opened up the hearing making several key points about the bill. He talked about how portable tenant screening reports are good for consumers. He also mentioned that even though industry always initially resists change, they end up adjusting. This is why the bill allows 18 months for the market to adjust to the change before the law goes into effect. Many advocates testified to the importance of the bill including Ashley Albert, Kimberly Mays, and Thomas Green. These three testified at the committee hearing of the Senate version of the bill back in Week 2. At this hearing, Emerging Advocates Program grad and Real Change Vendor of the Year Susan Russell joined to share her personal story of experiencing housing barriers because of the repeated and high cost of tenant screening fees. Representative Steve Kirby (29th LD-Tacoma) expressed strong feelings of frustration with the tenant screening industry’s lack of movement on the issue over the years. It was an important moment in the hearing that you can watch below. Many of us who have been working for years to find a compromise solution that still adequately solves the problem share the representative’s frustration. Please click here send Rep. Kirby a quick note to thank him. Right now, all evictions are reported as equal, no matter the outcome. Tenants can be wrongfully sued, prevail in court, be evicted by a bank because their landlord foreclosed, or reach a settlement with the landlord. But all these are reported as if the tenant actually lost. Susan Watchie Olden came to the committee to share how this issue has impacted her life. Years ago, a landlord wrongfully sued her, and she prevailed in court. The landlord had to pay her a settlement. She was able to continue renting the home until her son graduated from high school later that year. But the eviction on her record has closed door after door. Most landlords will categorically deny any tenant associated with an eviction lawsuit, and Susan is living this reality years after the eviction was filed. Innocent tenants are marked for life because the court’s database keeps the records available to the public, even after the seven years in which a tenant screening company is not supposed to report on them. “Innocent until proven guilty” one of our country’s most foundational legal principles, is often denied to tenants. Merely being named marks you with a “scarlet letter” and closes many doors indefinitely. As Susan so succinctly pointed out, “I found at there is no such thing as exoneration when it comes to eviction court.” You can watch her entire testimony below. The bill had a diverse group of supporters lined up to educate lawmakers on who is impacted by this discrimination, how it disparately impacts households at high risk of discrimination and, in the case of one landlord, why participating in the federal Section 8 Housing Choice Voucher Program is good for both tenants and landlords alike. Tamra Gray, a veteran from Longview, shared her remarkable story of experiencing homelessness with her children and the many doors that were closed to her once she obtained tenant-based rental assistance from Longview Housing Authority. After she finally secured housing, she was able to recover and stabilize her life, moving on to secure a job with Longview Housing Authority where she assists other vets who are experiencing the housing struggles she so recently experienced herself. You can watch her testimony below. “Every place I called, I was immediately told that they do not take Section 8. I called about 30-40 places and even with my monthly income of $1500, a clean criminal record with no evictions and good rental history, I was still denied every time. Eventually I was going to give up, but decided to try and drive around to look at places around Bellevue. The first place I went to was called Castle Creek. They were happy to accept me and I am still living here now and loving it. Next week will be the fifth week of the session, which means we are already over 1/4 of the way through! February 20, the first cutoff date of the long session, is just around the corner. The first cutoff requires that all bills must be voted out of their policy committee in their house of origin, or be “dead” for the session. For example, SB 5123 (Frockt), the Fair Tenant Screening Act, must be voted out of the Senate Financial Institutions and Insurance Committee by the 20th in order to continue its path to becoming law. Show your support for this and the other important tenant bills by clicking here to quickly send an email to your lawmakers today. And please take an extra second to personalize it, which makes your email even more effective! Lastly, if you haven’t yet registered for Housing and Homelessness Advocacy Day, make sure you do so today! You won’t want to miss this valuable and energizing advocacy experience. You will join 600 other advocates to both learn more about the issues and to educate lawmakers on the importance of this year’s affordable housing and homelessness agenda. Learn more and register here.